favour of the respondents by which the appellants are aggrieved. in the light of the judgment of this Court. which the share sought was 1/28th. on 18th February, 1988, she acquired the share in the property as claimed. 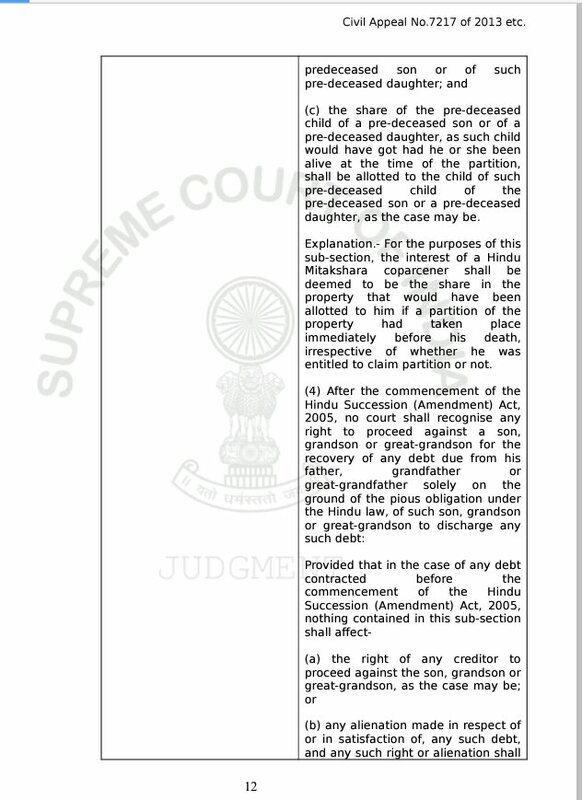 amended the plaint so as to claim share as per the Amended Act 39 of 2005.
the judgment of the trial court. applicable on the date of opening of succession which was to apply. section (5) to Section 6.
proceedings, only if the amendment was applicable at all. 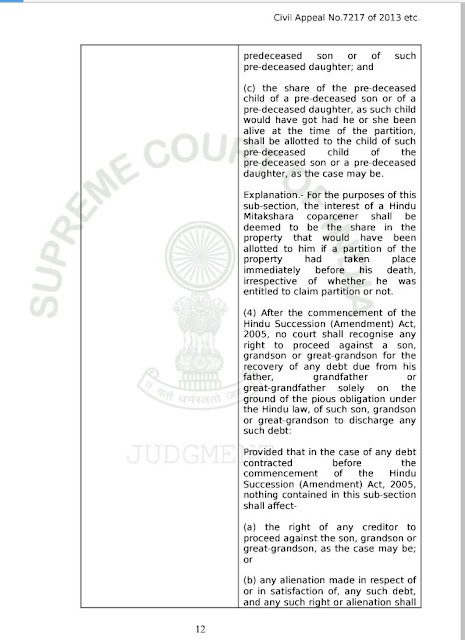 statutory notional partition remains valid and effective. this finding, the view of the High Court cannot be sustained. 19. Interpretation of a provision depends on the text and the context. legislature has to be given. purpose, different rules of interpretation have been applied. language or purpose so require, the explanation can be so interpreted. Explanation or the proviso in question. 24. On above interpretation, Civil Appeal No.7217 of 2013 is allowed. proceedings having regard to intention of legislature in a particular law. There is no dispute with the propositions laid down in the said decisions. present case to support the stand of the respondents. statute applicable to all pending suits on the commencement of the Act. give relief against indebtedness to certain specified persons. contrary to the scheme of the new law. 25.5. There is also no conflict with the principle laid down in V.K. passed, there was an amendment in the Hindu Succession Act (vide A.P. 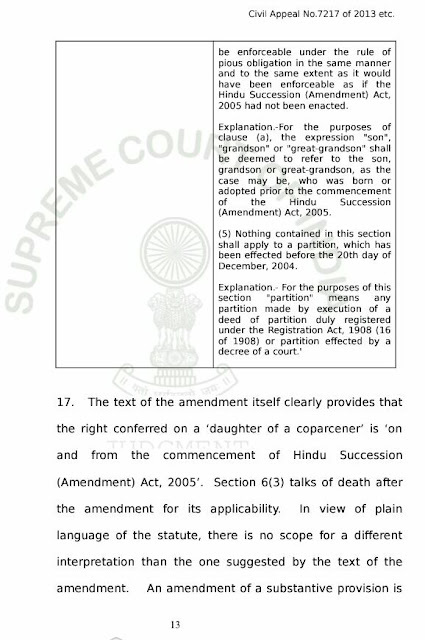 Amendment Act, 1986) allowing share to the unmarried daughters. 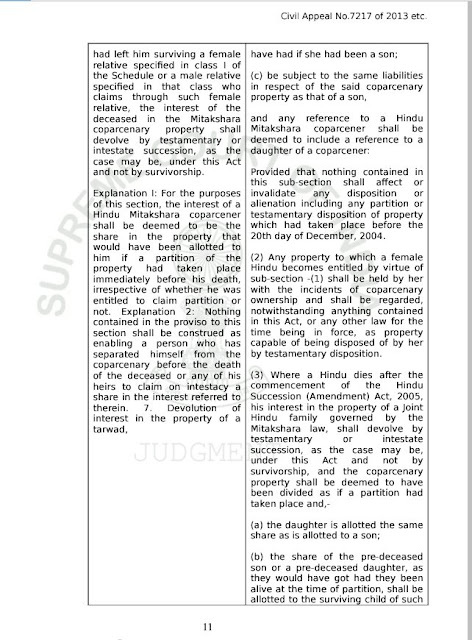 the position in Prema and Ganduri cases (supra). and alive on commencement of the Act. U.P. or other similar decisions for deciding the issue involved herein. 26. We now come to the decisions relied upon by the appellants. In M.
evidently, the provisions of Amendment Act, 2005 would have no application. fiction. In Shyama Devi and Anar Devi cases, same view was followed. settlement was not required to be registered. Santosh Hazari vs.
reasons of the trial court while reversing its findings. 26.4 Kannaiyan vs. The Assistant Collector of Central Excise, C.I.T.
did not create new rights. came up for consideration needs to be gone into as Part II of this order. since been decided by this Court in Danial Latifi vs. Union of India. plea that a muslim woman could invoke fundamental rights in such matters. referred to examine validity and reasonableness of a provision. Costume Make-up Artists and Hair Dressers Association” in film industry. It was held that such discrimination violates basic constitutional rights. by separately registering the matter as Public Interest Litigation (PIL). recent Articles appearing in the press on this subject. 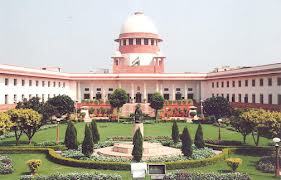 the appropriate Bench as per orders of Hon’ble the Chief Justice of India. For Appellant(s) Mr. Anil C. Nishant,Adv. Mr. Shanth Kumar V. Mahale,Adv. for M/s. S.M. Jadhav & Company,Advs. of the Bench comprising Hon'ble Mr. Justice Anil R. Dave and His Lordship. All the pending applications stand disposed of. (2001) 3 SCC 179, para 15. “ Para 33……. This Court in Olga Tellis v. Bombay Municipal Corpn. Court” by Dipti Nagpaul D’Souza.